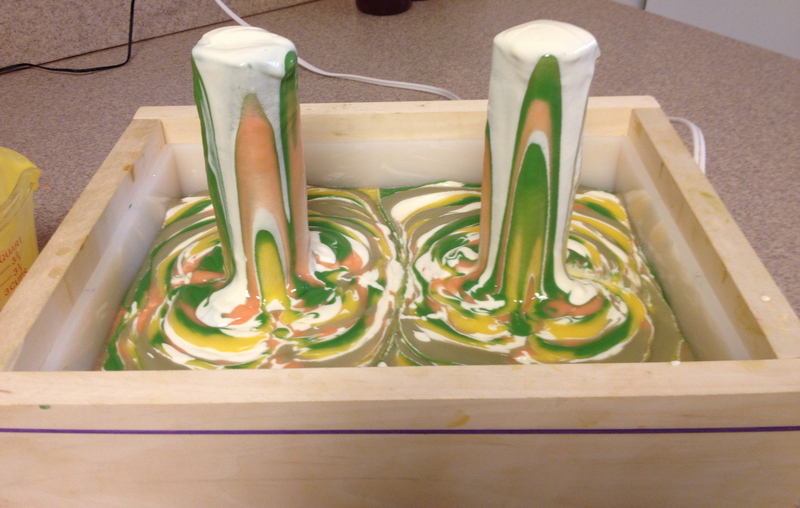 The design Amy presented this month’s Soap Challenge Club is the column pour. 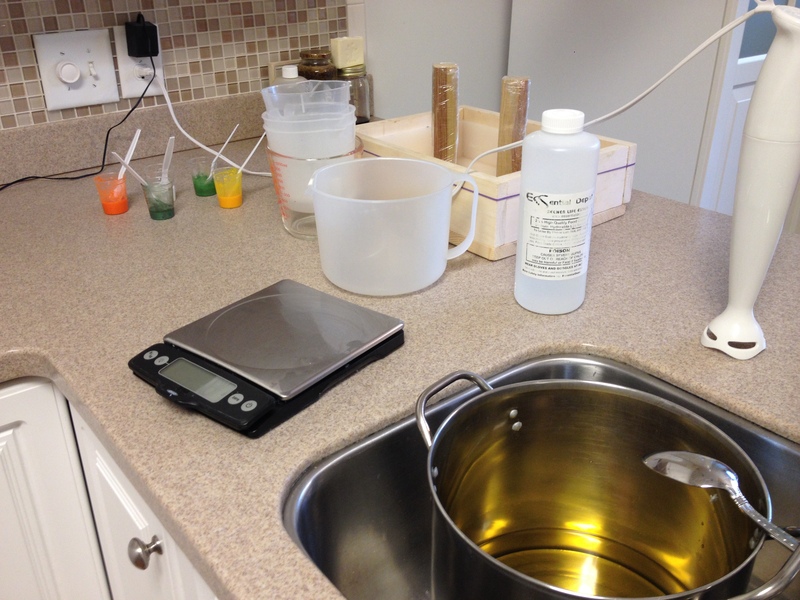 This is where you select as many colors as you would like and then alternate pouring them over a column(s). The pattern will appear depending on the shape of the column you use. 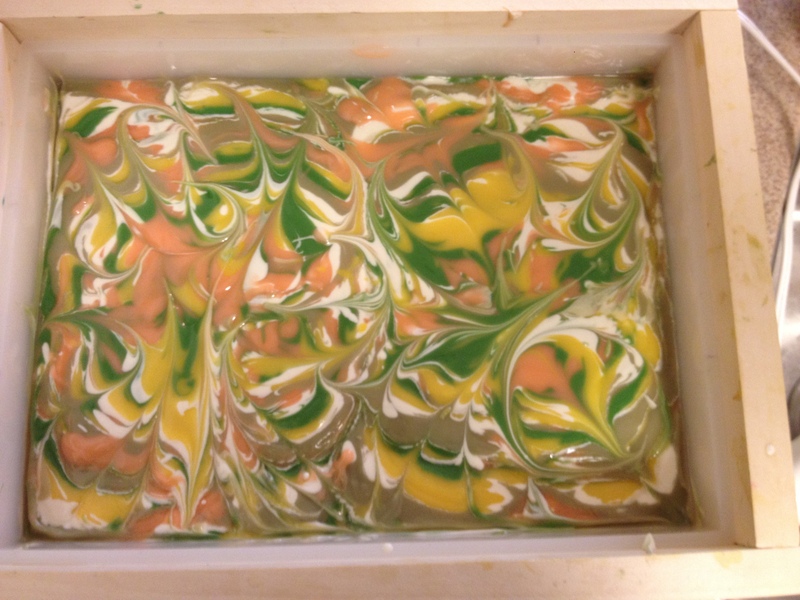 When all the soap batter is poured you simply remove the column(s) and then decide whether you want to add interest by swirling the pattern. 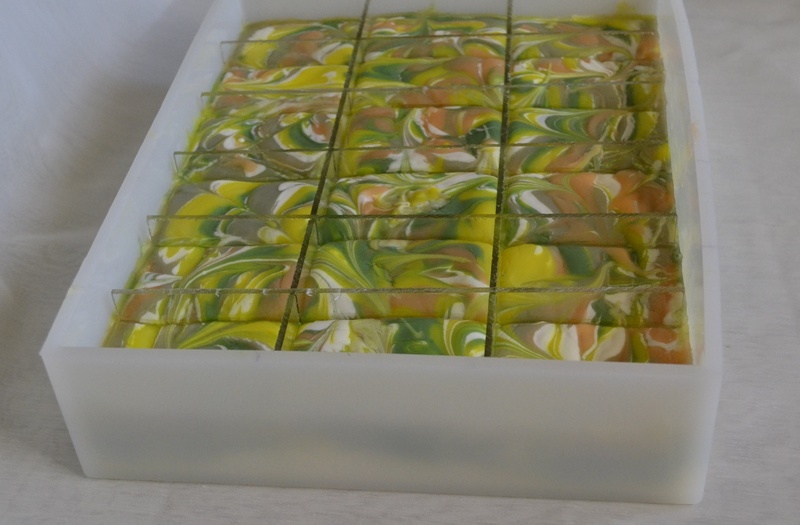 I chose Kumquat from Brambleberry for my fragrance since it is supposed to behave well in cold process soap (i.e., it does not overly thicken the soap or change the color of your soap). Plus it smells wonderful. Since kumquats look a lot like oranges, I decided my colors would be orange (BB’s Tangerine Wow), yellow (BB’s Fizzy Lemonade) and green (Chrominum Oxide Green and Starlight Green mica) with white (BB’s TD) for contrast. Note to self – the Starlight Green looked great when first mixed but morphed to a split pea soup color so don’t use it in CP. Here are the pictures of the process and results. 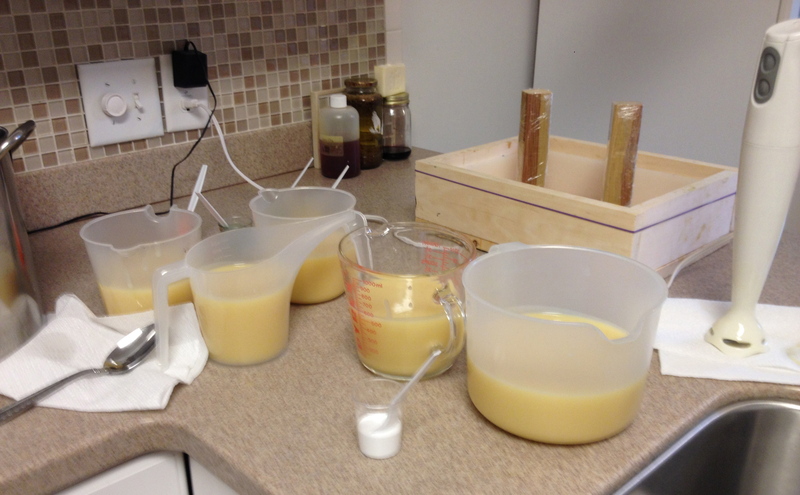 Soap batter divided up for colors. Dividers in and ready for to be wrapped up to gel. This was another fun challenge. Thanks Amy for all your efforts and Brambleberry for sponsoring this month’s challenge. 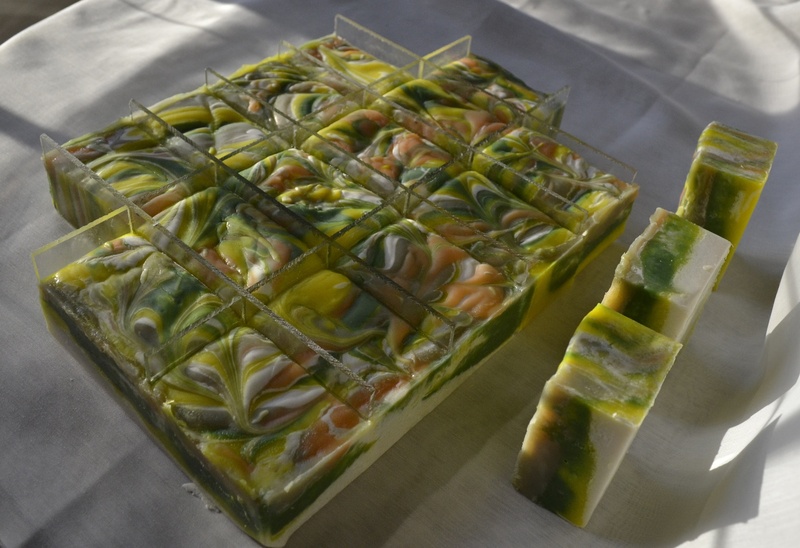 This entry was tagged cold process soap, column pour, Kumquat, Soap, Soap Challenge Club. Bookmark the permalink. What did you use for columns? Terry – I had a piece of regular 2×2 in the garage that I cut two 7 inch pieces off with a power saw – then I wrapped those pieces in Saran Wrap. Thanks for visiting our blog. Nice color combos with the Kumquat. 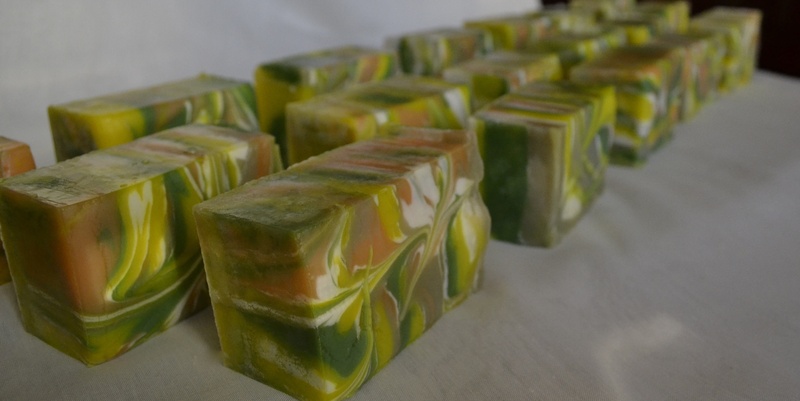 It’s fun to see the creative soaps in this challenge! Thanks. It is fun to see what other soapers design. Summer, summer, summer! And the flower fields! 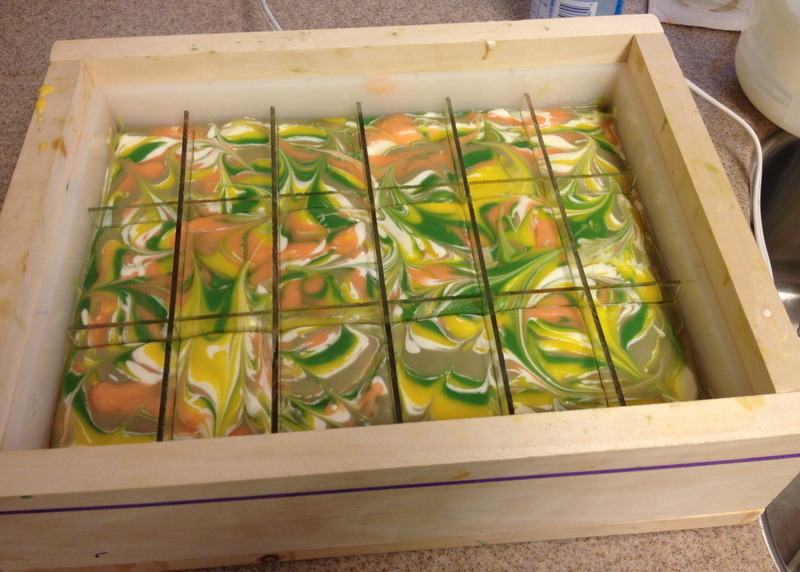 … is what came to mind when I saw your beautiful soap!